At a recent photography workshop I attended in Northern Arizona, I learned something I hadn’t really paid much attention to in the past, Hyperfocal distance. LeRoy DeJolie, our workshop instructor and amazing photographer, showed us a simple way of dealing with Hyperfocal Distance without whipping out a range finder, tape measure, or just plain trying to guess. I’m not a hyperfocal distance expert, but I basically think of it as a point where everything in the image is in focus (maximum depth of field). This is important in landscape photography because it is common to have something in the foreground (rock, plant, tree branch, etc.) and of course the main subject of your photo which may be an extended distance from the foreground object. It’s really great to have everything in focus rather than the foreground or background slightly out of focus. DOF is determined by the focal length of the lens and aperture. For landscape photography, if you want everything in focus in your image, you typically use a wider angle lens and a smaller aperture (larger f-stop number). I normally try to use f11 or f16, this gives me sharp images without diffraction which would cause the image to appear not so sharp. If I came across this situation in the past, I would try to focus on something about a third of the way into my composition. This actually works fairly well, but not perfect. The little trick that LeRoy taught us was to set the camera to manual focus, focus on the far subject, then adjust the focus so the near subject is perfectly in focus and then split the difference. 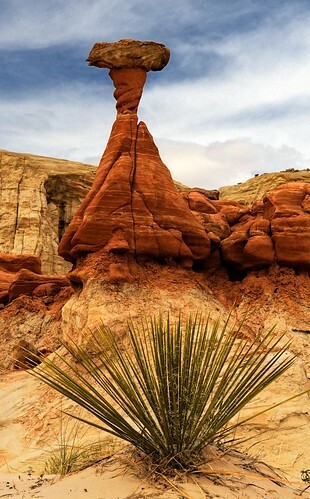 This has worked very very well for me and I used this method in the following image taken near Page, Arizona.